The pine barrens of New Jersey look rather plain and boring if you only see them while driving past on the Garden State Parkway or New Jersey Turnpike. There is sandy soil, lots of pine trees, and not much else. But when you get out and explore on foot the variety of life in the specialized ecosystem is pretty amazing. Snakes, butterflies, birds, frogs, moths, lizards, spiders, and a host of other creatures make the pine barrens their home, to say nothing of a whole bunch of neat plants. Fortunately, the pine barrens largely resisted development because of the poor soil which is unsuitable for growing crops. Some industry did sprout in the pine barrens in the colonial period, including iron foundries and charcoal making, but none could stay competitive and they eventually failed and the pines grew back. 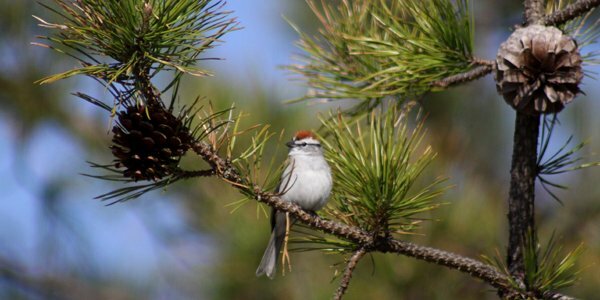 By the time urban and suburban sprawl started to reach New Jersey’s pine barrens they were largely protected and today over 1.1 millions acres are protected as the Pinelands National Reserve where development is controlled by an agency called the New Jersey Pinelands Commission. Lepidopterists, botanists, and herpetologists, that is, those who like butterflies, plants, and reptiles and amphibians, are drawn to the pine barrens by a host of species that either can be found only there or are found in great numbers there because of the huge areas of good habitat. My visit this past Saturday was in the company of Seth and Gene and our goal was to find cool snakes, a mission which largely failed because of the earliness of the season and plain old bad luck. The one snake we did see was a water snake that we had in sight for maybe two seconds before it disappeared. But our five hours in the pine barrens were not a waste at all as we all enjoyed just being in the pines and seeing what other types of creatures were there to see. One of the things I like about looking for snakes is that you tend to turn over logs and rocks to see what is beneath and while there is rarely a snake looking back at you there are often some neat things to find. 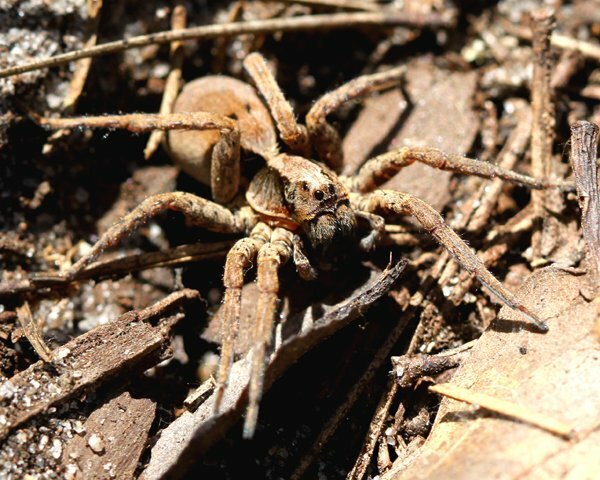 The Carolina Wolf Spider, the largest species of wolf spider in North American, is one example. I spent large amounts of time trying to get photos of the few species of butterfly that were flying and managed a decent shot of just one, a Spring Azure. 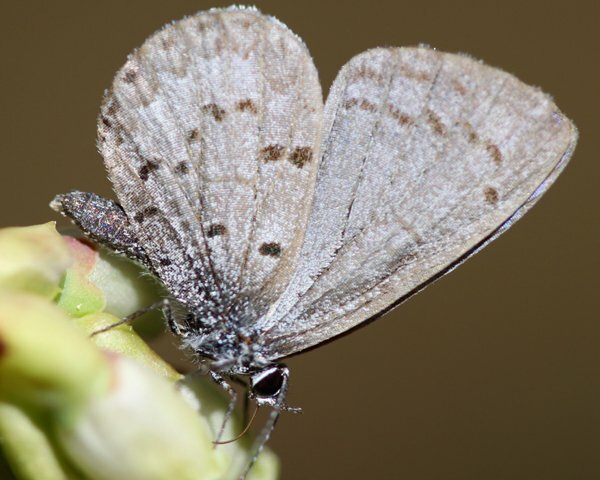 This is a fascinating species of butterfly that comes in several forms and the lepidopterists spend an inordinate amount of time arguing about how many species there are and what forms and species fly at what time and feed on what plant. If you ever want to start an argument among a bunch of butterfly people just start asking about azures. I am always pleased when I manage to get a decent shot of a dragonfly and was pleased to have two different dragonflies cooperate for me. The part I dread is when I get home and I start working through the field guide trying to figure out what I saw. 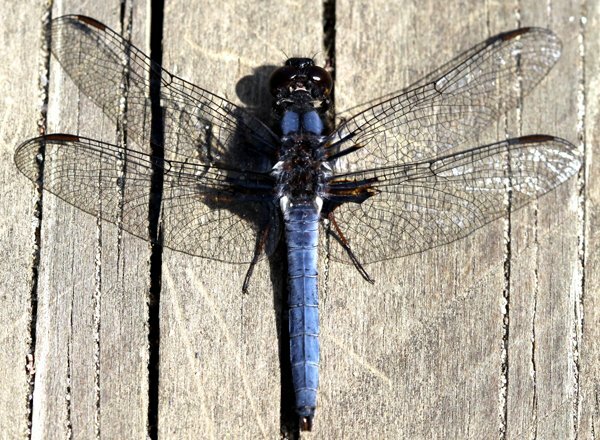 This time I was pleased that the two dragonflies turned out to be a male and female of the same species! But, of course, we were mainly looking for herps. 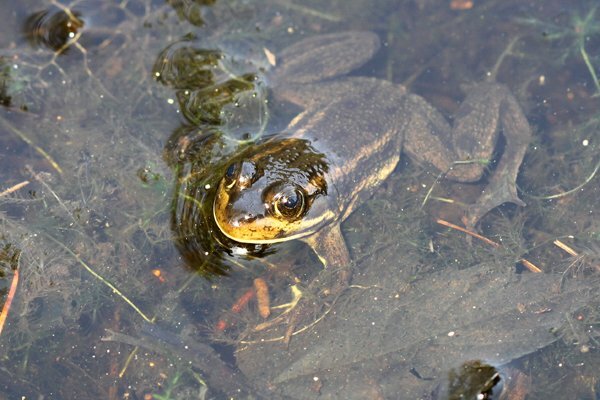 And while our snake-finding came up short we did find some other creatures, including Southern Leopard Frog and a host of Carpenter Frogs. We were really lucky to hear the latter species in chorus, and, sure enough, they sounded like a bunch of distant carpenters hammering away. I was bummed out that we did not manage to turn up a Pine Barrens Tree Frog, which is a cool little creature that I really want to see, but I guess that gives me a good reason to go back. 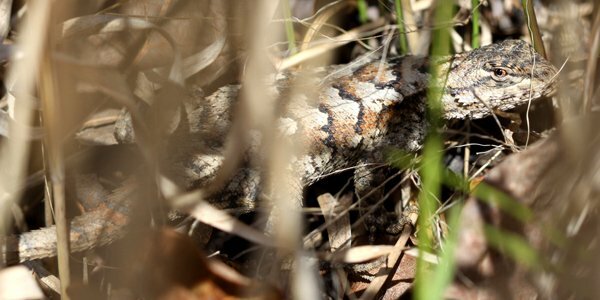 The best finds of the day were easily the three Eastern Fence Lizards that we found. 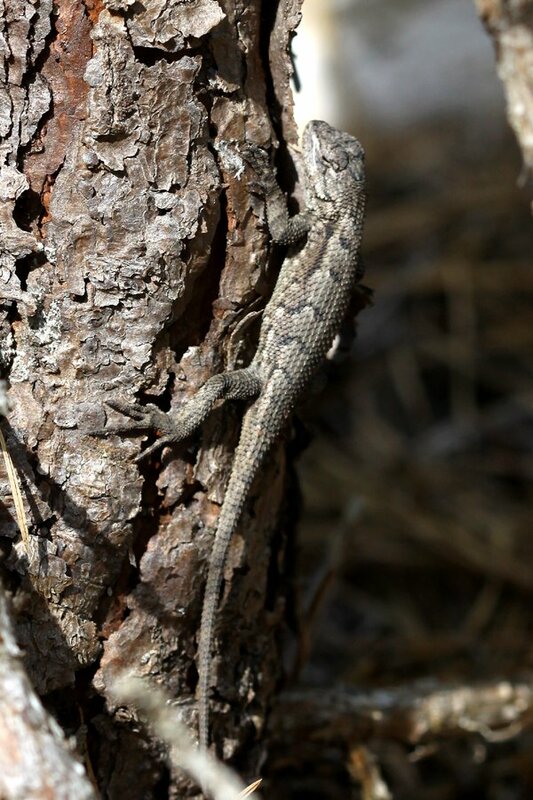 Having never seen them before and living as I do in New York City, a lizard-poor part of the country, I really got a kick out of seeing lizards scuttling. Of course this is a bird blog so I should probably at least mention some of the birds that we spotted. Pine Warblers, Turkey Vultures, and Carolina Chickadees, all birds that breed in large numbers in the pine barrens, were everywhere. There were also quite a few Chipping Sparrows, another bird that breeds throughout the barrens. Only a few Eastern Towhees were around and singles of Hermit Thrush, Ruby-crowned Kinglet, and White-eyed Vireo. The New Jersey Pine Barrens are in easy reach of Philadelphia and New York City though few seem to take advantage of this beautiful natural resource. I know that I will be going back and next time I hope I find that tree frog! One of my favorite places… wish I could get down there more. Where’s that boardwalk? Is that Webb’s Mill Bog? If not, you should go there in the summer and see/photograph the orchids. It’s awesome.